Conservation Fusion has been awarded a grant from the Disney Conservation Fund as a part of the Fund’s focus on reversing the decline of threatened wildlife around the world. The conservation grant recognizes our “Linking Lemurs and Living” program, which focuses on reforestation to increase lemur habitat and provide income and resources to the communities who share the forests with lemurs and other wildlife. Lemurs are a diverse group of over 111 different species of primates. These unique primates are prosimians, or pre-monkeys, found only on the island of Madagascar and known locally as “Varika” or “Gidro”. The “Linking Lemurs and Living” program benefits both lemurs and people, and also promotes the “One Health” philosophy; that clean, healthy environments create thriving, healthy wildlife and lemur populations resulting in multiple benefits to people, animals and the environment. Support from the Disney Conservation Fund allowed us to launch environmental education programs from the ground up, engaging community leaders and children to enhance awareness and behavioral change amongst local communities. Our programs promote action and we encourage people to take on ownership and leadership roles in protecting the forests and therefore ensuring sustainable livelihoods for populations. 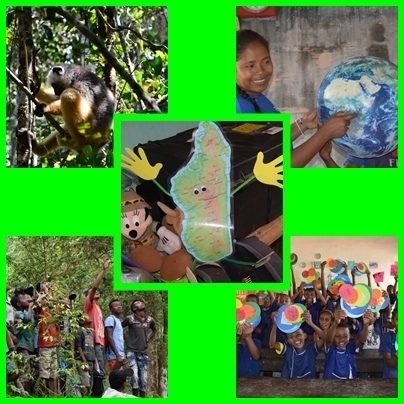 Among projects funded under the Disney Conservation Fund grant are reforestation, school educational programs, eco-adventures to visit National Parks and conservation camps. With support from Disney, we also initiated a community “One Health” clean up and art project. Stay tuned, in our upcoming blogs we will highlight and share the results of these projects with you. Since its inception in 1995, the Disney Conservation Fund (DCF) has granted more than $65 million to projects that help protect the planet and animals in 115 countries around the world. The DCF is committed to protecting the planet by collaborating with leading nonprofit organizations working to Reverse the Decline of at-risk wildlife and Increase the Time kids spend in nature to inspire a lifelong love of nature in young people. Learn more about the Disney Conservation Fund and its Reverse the Decline, Increase the Time initiative by visiting disney.com/conservation.